Balsamic Asparagus and Hummus Toast. 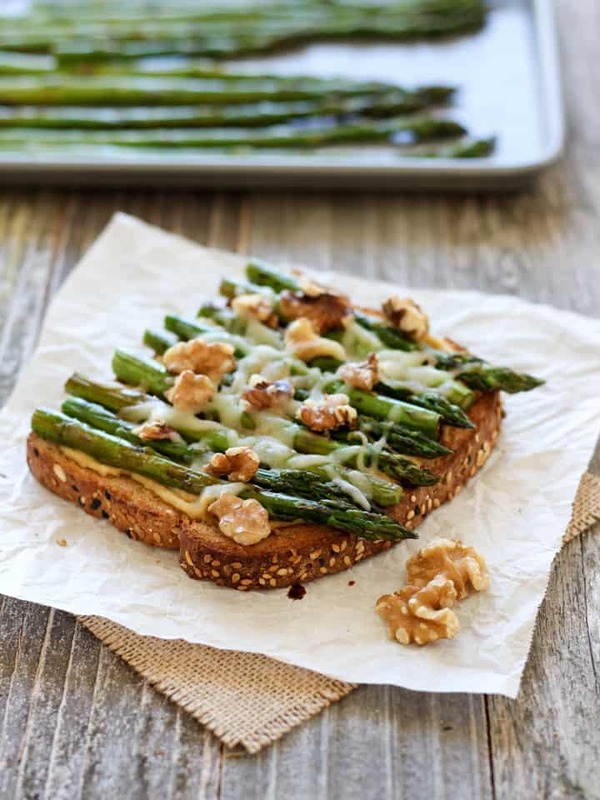 Crispy whole grain toast spread with creamy hummus and topped with balsamic roasted asparagus spears and melted cheese, a light but filling vegetarian lunch for two. Remember those springtime (in February) roasted asparagus spears we made last week? That balsamic drizzled batch of veggie yumminess was still on my mind while grocery shopping. As I puttered about the produce section the gorgeous bundles of thin spears kept calling my name. I finally put a bunch in my cart planning to roast it as a side dish for dinner. But then…I had to drive home. Do you ever think about your groceries on the way home? Not whether the milk has tipped over or if your eggs are in the bottom of that bag filled with canned beans. I started thinking about a warm toasted slice of the whole grain bread I bought (funny how bread is always the best sounding thing when you’ve missed lunch) smothered with hummus. Then topped with nuts, cheese and balsamic vinegar. Right about the balsamic vinegar is where two things occurred to me. This imaginary lunch didn’t have any vegetables and woo-hoo there’s fresh asparagus in my backseat! As soon as I got home, I started a batch of roasted asparagus spears, unpacked our groceries and gathered up the remaining toast ingredients. You are going to love how easy and flavorful this toast is. 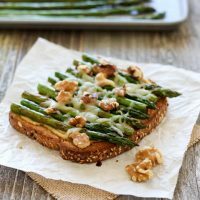 The creamy garlic hummus, tangy balsamic vinegar and buttery walnuts nicely compliment the sweet roasted asparagus. If you only have plain hummus on hand try sprinkling it with a pinch of garlic salt before adding the other toppings. This hummus toast is a rather light lunch on it’s own. So if you’re craving a bigger meal make your toast a sandwich by adding another slice of hummus covered toasted bread. Or treat yourself to a few of our Cranberry Orange Toaster Oven Oatmeal Cookies. According to the morning news this whole skipping half of winter and jumping straight to spring weather might be spreading beyond the west coast. If that’s true you’re going to want to be ready and pin this recipe 🙂 and while you’re already on Pinterest check out our Fruit & Veggies Recipes board for more killer seasonal produce recipes. 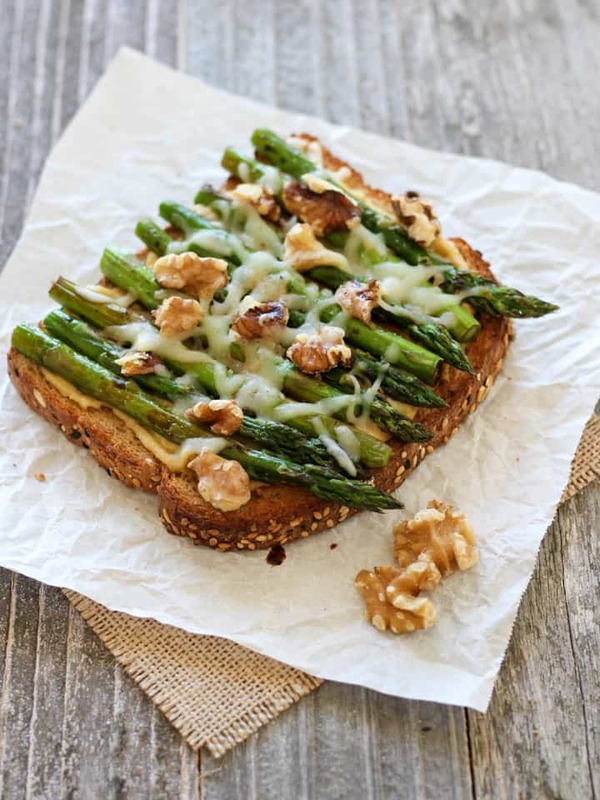 A light but filling vegetarian lunch of whole grain toast topped with hummus, roasted asparagus, melted cheese, walnuts and a drizzle of balsamic vinegar. Preheat toaster oven to 425 F and cut or snap the ends off the asparagus. Place asparagus on a baking sheet with tips facing the same direction. Drizzle with oil and sprinkle with salt and pepper. Roll the spears around the pan to evenly coat. Roast asparagus for 7 to 11 minutes or until fork tender but with a slight crispness. Cool slightly and then slice in half width-wise and set aside. Set toaster oven to toast setting and brush bread slices with oil. Toast bread until golden brown, cool 3 to 5 minutes before topping. Spread each cooled toast with 2 tablespoons of hummus. 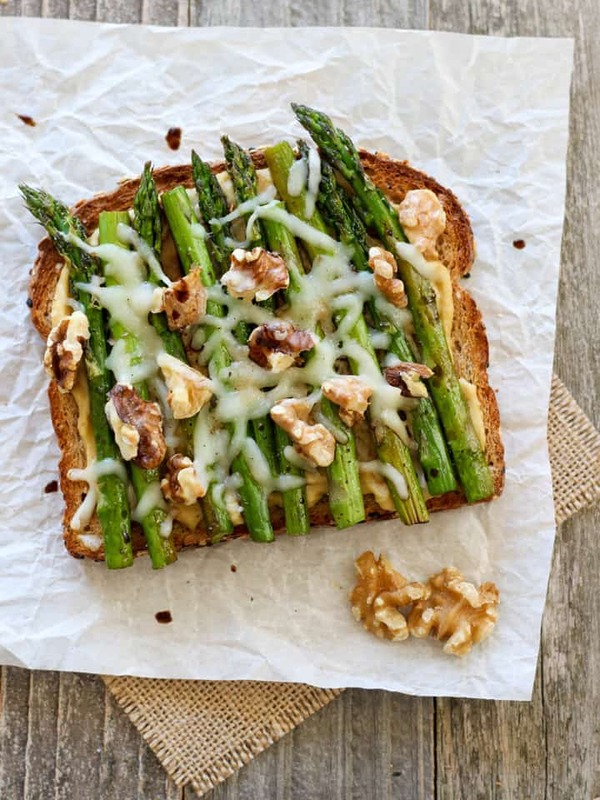 Evenly top with asparagus, walnuts and shredded cheese. Set toaster oven to broil. Place toasts on a cookie sheet and broil for 3 to 4 minutes until the cheese is melted. Drizzle toasts with balsamic vinegar and sprinkle with salt and pepper to taste. Serve warm with lemon wedges. If you only have plain hummus on hand try sprinkling it with a pinch of garlic salt before adding the other toppings. 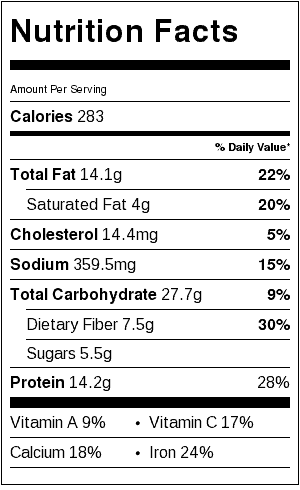 Nutritional information is an estimate for 1 of 2 asparagus and hummus toasts. This recipe was submitted to Meat Free Mondays at the yummy vegetarian blog Tinned Tomatoes – check it out every Monday for a week’s worth of delicious meat-free meals! I have everything to make this for lunch tomorrow. Looks excellent! Made a fabulous lunch! We’ll be making this again! Thank you so much for such a great recipe! P.S. I’m quite smitten with your blog, already sent the link for your Chilaquiles to the hubby to make this weekend. We’ve got leftover enchilada sauce in the fridge, I just need to get the chips! Looks like a perfect lunch or snack! I love walnuts so those make this extra special! This looks delicious! I’m going to have to try asparagus on toast soon! 🙂 thanks Mary Ellen, I think it would go perfectly on your yummy looking avo toast! This looks so goooooood! I never would have thought to eat asparagus on toast, great idea. And those walnuts, I can totally imagine how this tastes.